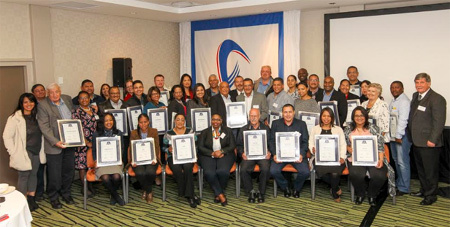 The relationship building and network event was attended by 95 stakeholders from 44 Companies across a myriad of sectors with whom the college has strong relationships with including ACSA, ESKOM, SAMBRA, Master Builders Association and the City of Cape Town. The guest speaker, Mr Solly Fourie: DEDAT: Head of Dept, spoke on the Western Cape Apprenticeship Game Changer. 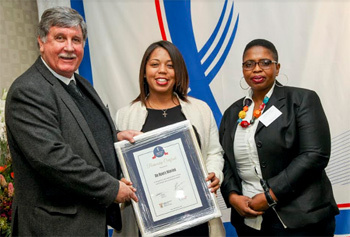 The Companies were honoured with a partnership certificate from the College Principal, Mr Cassie Kruger and the College Council Chairperson, Ms Zoliswa Lonja. “Excellent morning – great networking opportunities. Delighted to receive this beautiful certificate which we will share with all the participating clubs and then hang it in our District Rotary office in pride of place. Learnt so much about the history and more importantly the future plans, identified additional partnership opportunities, in addition to current support for young entrepreneurs, we also could also find ways to help with apprenticeships and potential links to the new Swartklip campus” – Geraldine Nicol –Rotary International; District 9350. Chairperson of the Rotary District Entrepreneurship Committee. “False Bay TVET College understands more than anyone the importance of employers in providing workplace experience, internship and employment opportunities for College students and graduates. What’s positive to see is that both private and public organisations are now recognising that engaging a diverse range of young people and opening up workplace opportunities is the only way to assist young people in gaining work experience and thus increasing their employability. And this is being supported by collaboration with industry. We thank all our partners for continued support and commitment.” Said Ms Christiana Nel. False Bay TVET College has 5 campuses situated in the Southern Peninsula and offers programmes in a multitude of study fields including Business, Engineering, Hospitality, Educare and Information Communication Technology.